Brief history of Red Triangle: When Gulf pulled out of California in '75, their jobber in Fresno created this brand for their stations. At the beginning, these were all former Wilshire/Gulf locations. Thanks to David Aldred for this info. 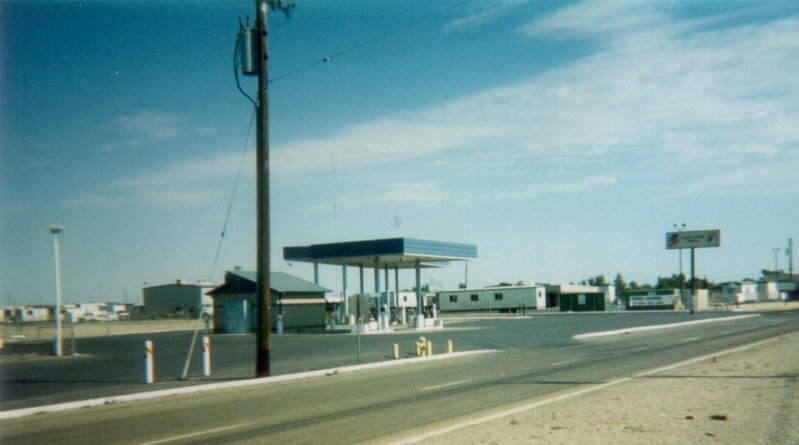 Former Red Triangle station in Cutler, California. 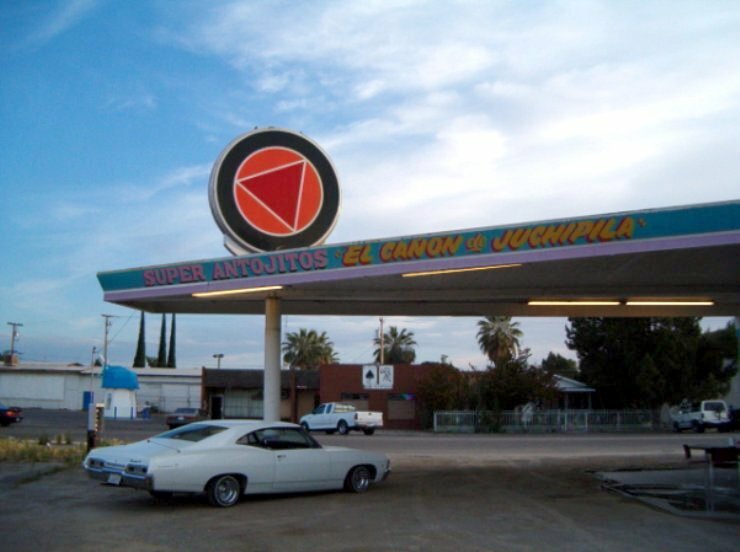 Now it's El Canon Juchipila, a taco stand as of May 30, 2005. 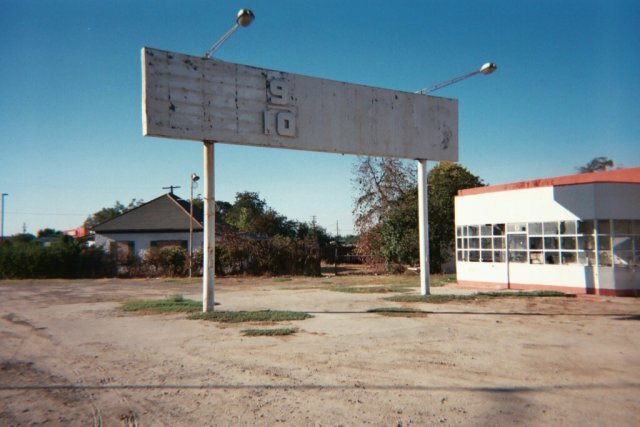 Located at 1st Drive and Route 63 (actually Avenue 404 and Road 126 in Tulare County general numbering) in Cutler, CA. This is the only Red Triangle I've seen in Tulare County, showing that the brand at least got into the northern part of Tulare during its heyday. Photo and text by J. Eric Freedner. Second shot of the Cutler, CA location by J. Eric Freedner, May 30, 2005. Nine months later, another shot of the Cutler, California location. 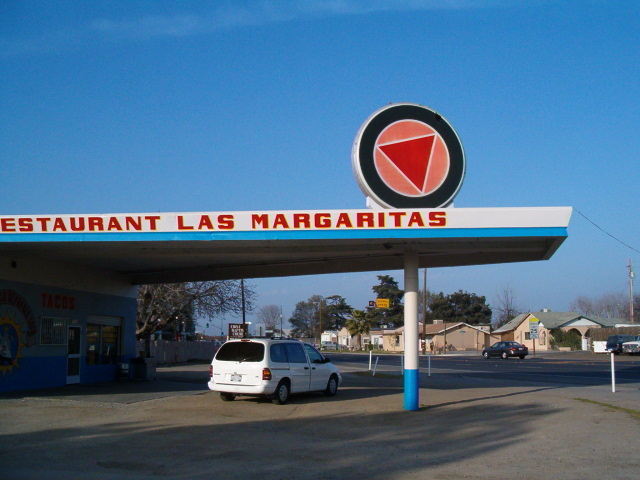 The taco stand is still operating, but the name has changed to Las Margaritas. Photo taken February 12, 2006 by J. Eric Freedner. 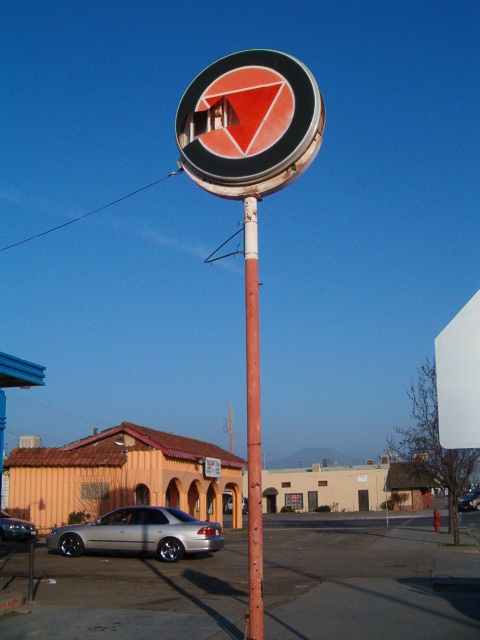 Next - another hypnotic Red Triangle sign in downtown Orange Cove, CA - site is now a tire and retread shop. Looks like someone tossed an orange through the sign at some point. Photo taken February 12, 2006 by J. Eric Freedner. Red Triangle sign in Fresno, CA near the Chestnut Ave. exit where this company still maintains its yard. 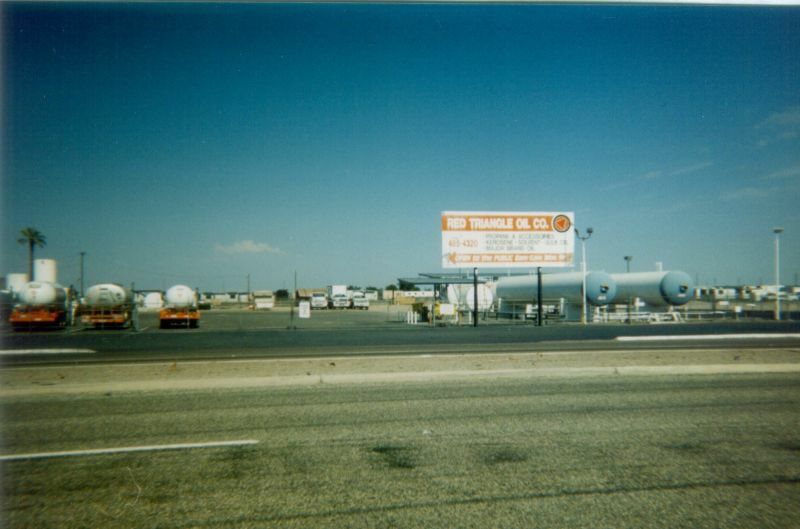 They used to have a station at the freeway off-ramp. 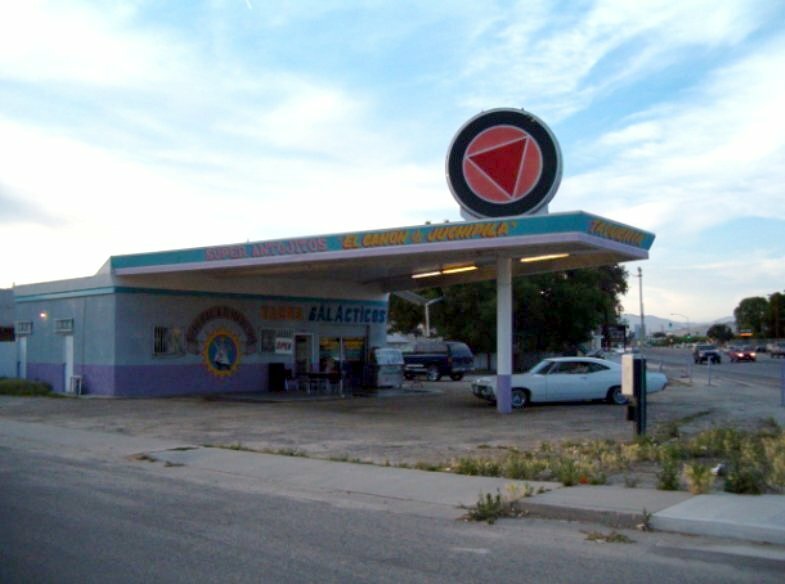 There were Red Triangle stations all over Fresno County and the surrounding areas some years ago. They cut out most of their company-owned stations. This is the only one of their big signs still around. Photo taken July 20, 2003 by J. Eric Freedner. The main office of Red Triangle at 2809 S. Chestnut Ave. in Fresno, CA. The sign reads FLEET FUEL SERVICE and CFN (Consumers Fueling Network). Red Triangle cardlock station just beyond the oil tanks in the above photo. 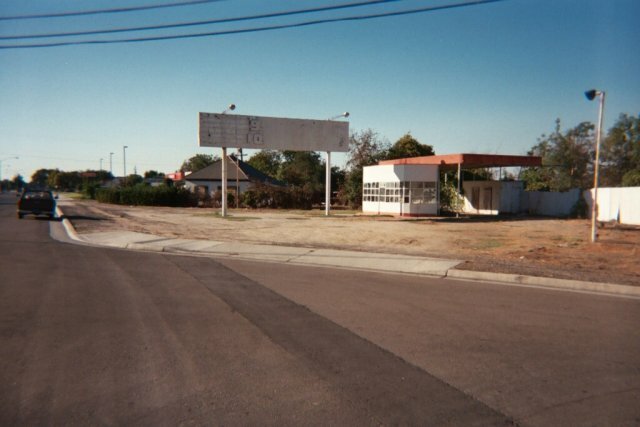 Two shots of a former RED TRIANGLE station at the corner of Whitson (old Route 99) and Stillman in Selma, California. The lights over the sign look like regulation street lights. 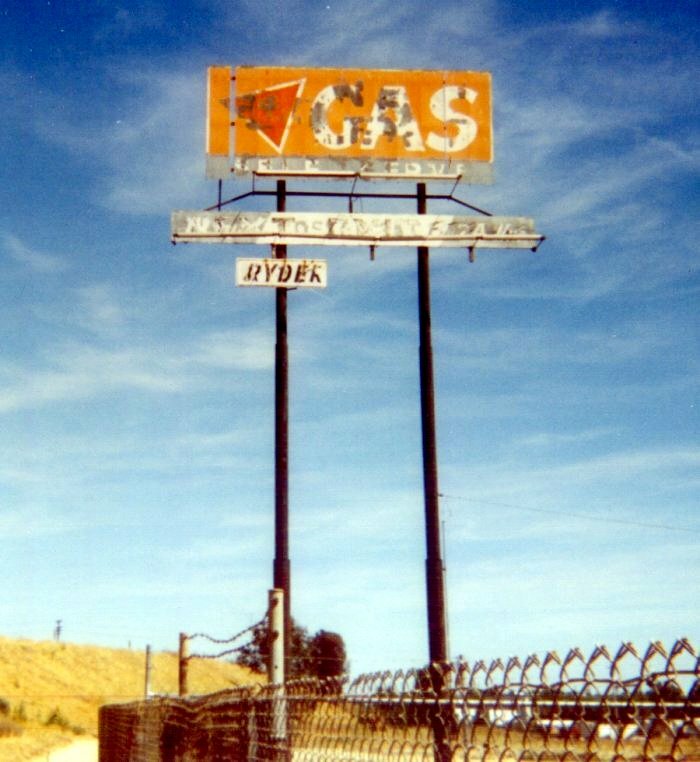 Probably you can't see it in the photo, but to the right of the 9/10 price on the sign, there is the painted-over triangle-within-circle logo and the word "GAS." Taken August 30, 2003 by J. Eric Freedner.